Hanging in effigy of the Leaders of Targowica Confederation, Warsaw, 1794, in the aftermath of the Warsaw Uprising (1794). Painting by Jan Piotr Norblin. The Targowica Confederation (Polish: konfederacja targowicka, IPA: [kɔnfɛdɛˈrat͡sja tarɡɔˈvit͡ska], Lithuanian: Targovicos konfederacija) was a confederation established by Polish and Lithuanian magnates on 27 April 1792, in Saint Petersburg, with the backing of the Russian Empress Catherine II. 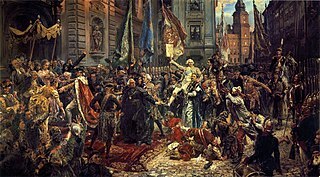 The confederation opposed the Constitution of 3 May 1791, which had been adopted by the Great Sejm, especially the provisions limiting the privileges of the nobility. The text of the founding act of the confederation was drafted by the Russian general Vasili Stepanovich Popov, Chief of Staff of Prince Grigori Alexandrovich Potemkin. Its purpose was proclaimed in the small town of Targowica and the Potocki's estate (now near Novoarkhanhelsk in Kirovohrad Oblast, Ukraine) on May 14, 1792. Four days later two Russian armies invaded the Polish-Lithuanian Commonwealth without a formal declaration of war. The forces of the Targowica Confederation defeated the troops loyal to the Polish–Lithuanian Commonwealth, the Sejm and King Stanisław August Poniatowski in the Polish–Russian War of 1792. As a result, the King, Poniatowski, formally joined the Confederation. Their victory precipitated the Second Partition of Poland and set the stage for the Third Partition and the final dissolution of the Commonwealth in 1795. This outcome came as a surprise to most of the Confederates, who had wished only to restore the status quo ante and had expected that the overthrow of the May 3rd Constitution would achieve that end. The term targowiczanin, which historically applies to each member and supporter of the Targowica Confederation, became a synonym for a traitor, just as targowica is synonymous with treason. Those meanings still function in the Polish language up to the present day. Stanisław Szczęsny Potocki: Marshal (head) of the Confederation. Sentenced to death, but never apprehended. Instead, on September 29, 1794, his portrait was hanged (see illustration). In 1795 he was rewarded by Catherine the Great with the Russian Order of Alexander Nevsky and the rank of Général en chef. Józef Ankwicz convicted of treason and sentenced to hanging on 9 May 1794.
ambassador Karol Boscamp-Lasopolski hanged June 28,1794. Franciszek Ksawery Branicki: Sentenced to death during the Kościuszko Uprising, but never apprehended. Having emigrated to Russia, he died at Belaya Tserkov, 1819. Szymon Marcin Kossakowski: Hanged in Wilno on April 25, 1794, during the Kościuszko Uprising. Józef Kazimierz Kossakowski: Bishop. Hanged May 9, 1794, in Warsaw during the Kościuszko Uprising. Ignacy Jakub Massalski: Bishop. Hanged June 28, 1794, in Warsaw during the Kościuszko Uprising. hetmen Piotr Ożarowski convicted of treason and sentenced to hanging on 9 May 1794. Felix Potocki was never apprehended; his portrait was hoisted on the gallows instead. Seweryn Rzewuski Sentenced in absentia by the Supreme Criminal Court to death and the confiscation of his estates. Executed in effigy on 29 September 1794. Józef Zabiełło convicted of treason and sentenced to hanging on 9 May 1794. "The desires of Her Highness Empress of Russia [Catherine the Great], ally of Rzeczpospolita [the Commonwealth], are and were no other than by using her armies to return to Rzeczpospolita and Poles the freedoms, and especially security and happiness to all citizens"
"Each true Pole, not blinded by the Prussian and royalist cabal, is convinced, that our Fatherland can only be saved by Russia, otherwise our nation will be enslaved". "About past Poland and Poles [I don't want to talk anymore]. Gone is this country, and this name, as many others have perished in the world's history. I am now a Russian forever." ^ a b c d Daniel Stone (2001). The Polish-Lithuanian State: 1386–1795. University of Washington Press. pp. 282–285. ISBN 978-0-295-98093-5. Retrieved 8 January 2013. ^ Tanisha M. Fazal (27 October 2011). State Death: The Politics and Geography of Conquest, Occupation, and Annexation. Princeton University Press. pp. 107–108. ISBN 978-0-691-13460-4. Retrieved 8 January 2013. ^ Patrice M. Dabrowski (2004). Commemorations and the Shaping of Modern Poland. Indiana University Press. p. 101. ISBN 978-0-253-34429-8. Retrieved 8 January 2013. ^ a b c Richard Butterwick (1998). Poland's Last King and English Culture: Stanisaw August Poniatowski, 1732–1798. Oxford University Press. p. 310. ISBN 978-0-19-820701-6. Retrieved 8 January 2013. ^ Jerzy Jerzy Jan Lerski (1996). Historical Dictionary of Poland, 966-1945. Greenwood Publishing Group. p. 268. ISBN 978-0-313-26007-0. Retrieved 8 January 2013. ^ Jerzy Jerzy Jan Lerski (1996). Historical Dictionary of Poland, 966-1945. Greenwood Publishing Group. p. 342. ISBN 978-0-313-26007-0. Retrieved 8 January 2013. ^ Balázs Trencsényi; Michal Kopeček (2006). Discourses of Collective Identity in Central and Southeast Europe (1770–1945): Texts and Commentaries. Central European University Press. pp. 282–284. ISBN 978-963-7326-52-3. Retrieved 8 January 2013. Stanisław II Augustus, who reigned as King of Poland and Grand Duke of Lithuania from 1764 to 1795, was the last monarch of the Polish–Lithuanian Commonwealth. He remains a controversial figure in Polish history. Recognized as a great patron of the arts and sciences and an initiator and firm supporter of progressive reforms, he is also remembered as the King of the Commonwealth whose election was marred by Russian intervention. He is criticized primarily for his failure to stand against the partitions, and thus to prevent the destruction of the Polish state. The Kościuszko Uprising was an uprising against the Russian Empire and the Kingdom of Prussia led by Tadeusz Kościuszko in the Commonwealth of Poland and the Prussian partition in 1794. It was a failed attempt to liberate the Polish-Lithuanian Commonwealth from Russian influence after the Second Partition of Poland (1793) and the creation of the Targowica Confederation. The Polish–Russian War of 1792 was fought between the Polish–Lithuanian Commonwealth on one side, and the Targowica Confederation and the Russian Empire under Catherine the Great on the other. The szlachta was a privileged social class in the Kingdom of Poland. The term szlachta was also used for the Lithuanian nobility after the union of the Grand Duchy of Lithuania with Poland as the Polish-Lithuanian Commonwealth and for the increasingly Polonized nobilities of territories controlled by the Polish-Lithuanian Commonwealth, including Ducal Prussia and the Ruthenian lands. The 1793 Second Partition of Poland was the second of three partitions that ended the existence of the Polish–Lithuanian Commonwealth by 1795. The second partition occurred in the aftermath of the Polish–Russian War of 1792 and the Targowica Confederation of 1792, and was approved by its territorial beneficiaries, the Russian Empire and the Kingdom of Prussia. The division was ratified by the coerced Polish parliament (Sejm) in 1793 in a short-lived attempt to prevent the inevitable complete annexation of Poland, the Third Partition. Franciszek Ksawery Branicki was a Polish nobleman, magnate, count, diplomat, politician, military commander and one of the leaders of the Targowica Confederation. He was appointed the Great Crown Podstoli in 1764, Ambassador in Berlin in 1765, Master of the Hunt of the Crown in 1766–1773, Artillery General of Lithuania in 1768–1773, Ambassador in Moscow in 1771, Field Crown Hetman in 1773 and Great Crown Hetman of the Polish–Lithuanian Commonwealth between 1774 and 1794. The Great Sejm, also known as the Four-Year Sejm was a Sejm (parliament) of the Polish–Lithuanian Commonwealth that was held in Warsaw between 1788 and 1792. Its principal aim became to restore sovereignty to, and reform, the Commonwealth politically and economically. The Patriotic Party, also known as the Patriot Party or, in English, as the Reform Party, was a political movement in the Polish-Lithuanian Commonwealth in the period of the Four-Year Sejm of 1788–92, whose chief achievement was the Constitution of 3 May 1791. The reformers aimed to strengthen the ailing political machinery of the Commonwealth, to bolster its military, and to reduce foreign political influence, particularly that of the Russian Empire. It has been called the first Polish political party, though it had no formal organizational structure. The Party was inspired by the ideals of the French Revolution, and its name, proudly used by themselves, was a tribute to the Dutch Patriots. Count Stanisław Szczęsny Feliks Potocki, of the Piława coat of arms, known as Szczęsny Potocki was a member of the Polish szlachta and a military commander of the forces of the Polish–Lithuanian Commonwealth and then Poland. Knight of the Order of the White Eagle, awarded in August 1775. Seweryn Rzewuski was a Polish nobleman, writer, poet, general of the Royal Army, Field Hetman of the Crown, Voivode of Podolian Voivodeship and one of the leaders of the Targowica Confederation. Czartoryski is a Polish princely family of Lithuanian-Ruthenian origin, also known as the Familia. The family, which derived their kin from the Gediminids dynasty, by the mid-17th century had split into two branches, based in the Klevan Castle and the Korets Castle, respectively. They used the Czartoryski coat of arms and were a noble family of the Polish–Lithuanian Commonwealth in the 18th century. Szymon Marcin Kossakowski was a Polish–Lithuanian nobleman (szlachcic), and one of the leaders of the Targowica Confederation. In 1793, he became the last Great Hetman of Lithuania. Prince Ignacy Massalski (1726–1794) was a Polish-Lithuanian nobleman. Piotr Ożarowski was a Polish noble (szlachcic), politic and military commander. Member of the infamous Confederation of Targowica, he reached the offices of Great Crown Hetman and castellan of Wojnice. Józef Ankwicz, of Awdaniec coat of arms, also known as Józef z Posławic and Józef Awdaniec, was a politician and noble (szlachcic) in the Polish–Lithuanian Commonwealth. He held the office of castellan of Nowy Sącz from 1782. Deputy to the Great Sejm, and most infamously, the Grodno Sejm: for his actions during the latter he is remembered as one of the most prominent collaborators with the foreign partitioners of Poland. Józef Kazimierz Korwin Kossakowski, of Ślepowron coat of arms, was a Polish noble (szlachcic), bishop of Livonia from 1781, political activist, writer, and supporter of Russian Empire. Józef Zabiełło h. Topór of was a nobleman (szlachcic) in the Polish–Lithuanian Commonwealth. Great Łowczy of Lithuanian from 1775, konsyliarz of Permanent Council from 1782, deputy of Samogitia to the Great Sejm and Field Hetman of Lithuania from 1793, he was infamous for his support of the Russian Empire in the last years of the Commonwealth. Józef Rufin Wybicki was a Polish jurist, poet, political and military activist. He is best remembered as the author of "Mazurek Dąbrowskiego", which in 1927 was adopted as the Polish national anthem. Kossakowski was a noble family of the Polish–Lithuanian Commonwealth of the Masovian descent. Józef Dominik Korwin-Kossakowski, was a Polish–Lithuanian statesman and military commander, a participant of Targowica Confederation and a colonel of the Polish Army. He used the Ślepowron coat of arms.